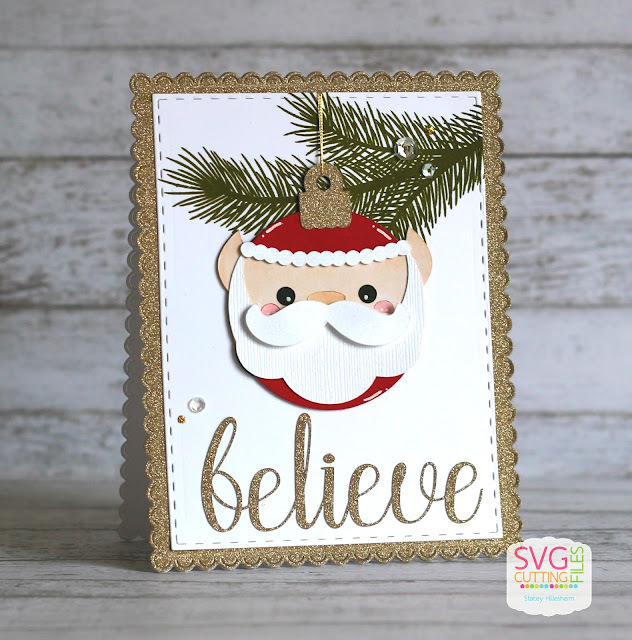 Stacey from Stacey's Creative Corner with you today and I will be showcasing a new file that will be in the store Friday called, Ornament Santa. I created a shaped card by die cutting glitter cardstock using some rectangle dies from Jaded Blossom. I stamped a tree branch onto some white cardstock and used a stitched rectangle die, also Jaded Blossom, to cut it out and layered that on top of my card base. I added that sweet Ornament Santa (isn't he cute??) to my card and added some gold thread so that he appears to be hanging from the branch. I used the text tool in my Cricut and typed out Believe and cut it out with some more glitter paper. I finished off my card with some clear sequins and a couple of drops of gold stickles. So sparkly and pretty! WOW! I LOVE this!! Absolutely beautiful!